#PrivacyCamp19: Programme 0.1 beta is here! UPDATE: THE FINAL PROGRAMME HAS BEEN PUBLISHED. 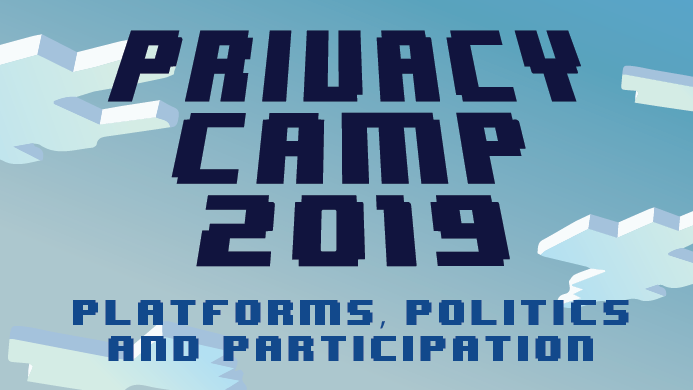 We’re happy to announce the beta version of the programme for our upcoming Privacy Camp 2019 (hashtag #PrivacyCamp19). The print version of the programme (pdf) and full descriptions of all panels will follow soon. including your first and last name. Please register before 20 January! If you want to register friends and colleagues, please also include their names. Make sure to register as soon as possible as places are limited for this free event! A first draft of the programme is following very very soon. Join us for the 7th annual Privacy Camp! Take me to the call for panel submissions. Take me to the call for user story submissions. If you have questions, please contact Kirsten at kirsten.fiedler(at)edri(dot)org or Imge at imge.ozcan(at)vub(dot)be. 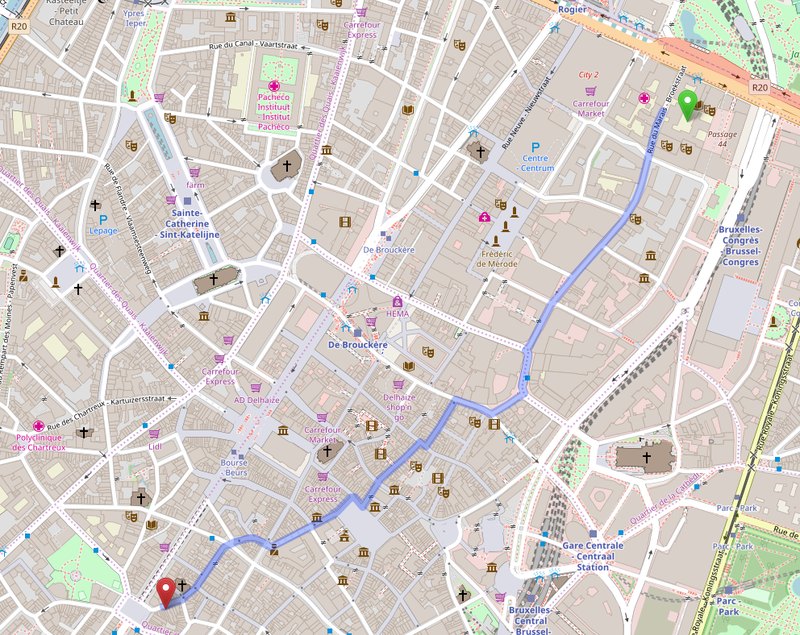 Privacy Camp is jointly organised by European Digital Rights (EDRi), the Institute for European Studies of the Université Saint-Louis – Bruxelles (USL-B), the Law, Science, Technology & Society research group of the Vrije Universiteit Brussel (LSTS-VUB), and Privacy Salon. Participation is free. Registrations will open in early December. Tomorrow, on 23 January 2018, Privacy Camp brings together civil society, policy-makers and academia to discuss problems for human rights in the digital environment. In the face of what some have noted as a “shrinking civic space” for collective action, the event provides a platform for experts from across these domains to discuss and develop shared principles to address key challenges for digital rights and freedoms. 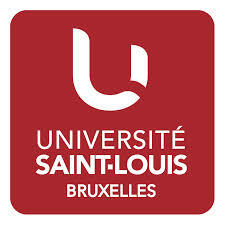 Themed “Speech, settings and [in]security by design”, the one-day conference at the Saint-Louis University in Brussels features panel discussions and privacy workshops led by experts in the fields of privacy, surveillance and human rights advocacy. The nonprofit, nonpartisan event draws privacy activists, civil society representatives, public servants and academia of all ages and backgrounds who are interested in improving privacy and security in communications and work towards the respect of human rights in the digital environment. This year, Privacy Camp also features the “Civil Society Summit” of the European Data Protection Supervisor (EDPS). 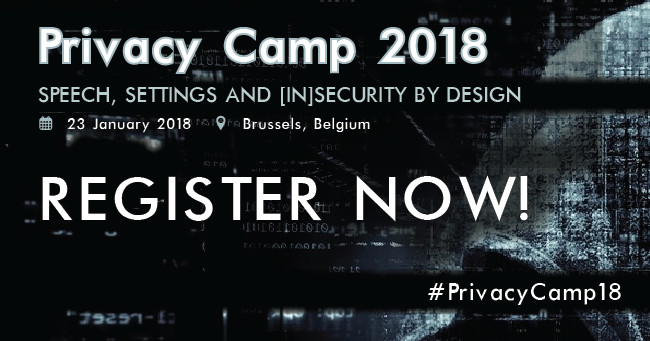 Among others, speakers of the Privacy Camp 2018 are Giovanni Buttarelli, Wojciech Wiewiorowski, Fanny Hidvegi, Glyn Moody, Katarzyna Szymielewicz, Juraj Sajfert, Marc Rotenberg. The full programme can be accessed here. All good things must come to an end. But not all things end quite as dramatically and with as much suspense as this year’s PrivacyCamp! Join our post-camp party at Smouss Bar! There will be complimentary snacks, free drinks (for those with a conference badge, so remember to register to get yours) and, most importantly, our legendary “Big Fat PrivacyCamp Quiz of 2018”. We’re happy to announce the publication of the draft programme for our upcoming Privacy Camp 2018 (hashtag #PrivacyCamp18). The print version of the programme (pdf) with a full description of all panels can be downloaded here. You can find it here and below. This year, we will also have two additional surprises for you: An Open Internet Privacy Bar where privacy cocktails will be served to you by the Privacy Training Center and an official after-party (with a quiz & real cocktails). Stay tuned for more details! The after-party will take place in Smouss Bar, from 19:00 onwards. Entry only with a conference badge! including your first and last name. If you want to register friends and colleagues, please also include their names. Make sure to register as soon as possible as places are limited for this free event! A first draft of the programme is following soon. Join us for the 6th annual Privacy Camp! 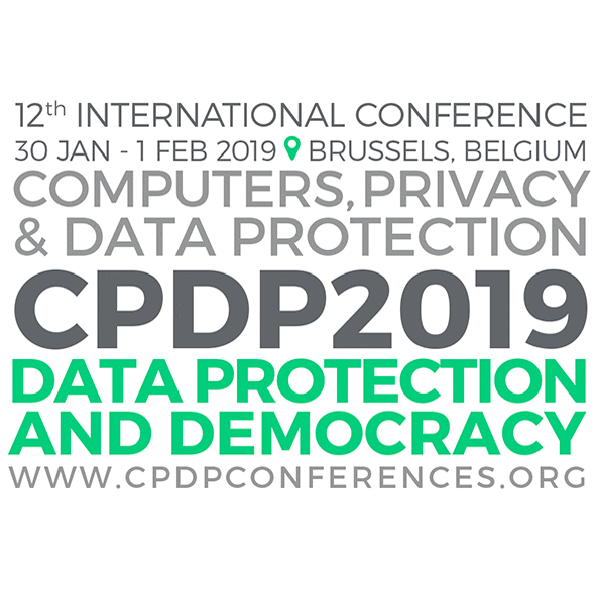 Privacy Camp will take place on 23 January 2018 in Brussels, Belgium, just before the start of the CPDP conference. Privacy Camp brings together civil society, policy-makers and academia to discuss existing and looming problems for human rights in the digital environment. In the face of a “shrinking civic space” for collective action, the event aims to provide a platform for actors from across these domains to discuss and develop shared principles to address key challenges for digital rights and freedoms of individuals. Our theme this year is “speech, settings and [in]security by design”. The event will feature two main tracks. The first will discuss the challenges to freedom of speech online and the potential of a digital public sphere and the second track will focus on the security of devices and infrastructure. Altogether, these two tracks will explore whether we can collectively design better data infrastructures and information architecture. Participate! The first track will focus on the challenging dynamics that we have been facing as we imagine a democratic digital public sphere. The topics covered will include the privacy-invasive measures to censor legitimate speech online as well as the role that algorithms play in curation and governance with sessions on algorithmic decision-making, accountability, fake news and the spread of propaganda. The second track will include sessions on state hacking and malware, law enforcement access to user data (so-called “e-evidence”) and device security. It will also include hands-on tutorials on how to protect your communications better. The event is co-organised by European Digital Rights (EDRi), Privacy Salon, USL-B Institute for European Studies and VUB-LSTS. Participation is free. Registrations will open in early December. Make it as participative as possible, think about how to include the audience and diverse actors as much as possible. Send us a description of no more than 500 words. Deadline for submissions is 20 November. After the deadline, we will review your submission and let you know by 6 December whether your panel can be included in the programme. It is possible that we suggest to merge proposals if they are very similar. Please send your proposal via email to Maren <edri.intern3(at)edri(dot)org>! If you have questions, please contact Kirsten <kirsten.fiedler(at)edri(dot)org> or Imge <imge.ozcan(at)vub(dot)be>.